My I AM Presence - Who is the Ascended Master Saint Germain? "Truly, America was designed from our octave and given so much assistance from there to be “the land of the free...."! Now, every nation and its people are dear to our hearts—for all are some expression of God's Life and His Life is the only Life there is. Each nation has a divine plan of its own to fulfill and, according to their divine destinies, the various nations of the world represent the various parts of the earth's body. Therefore, in the new age, the land of India shall represent the head of such an earth body and the land of America the heart. Take notice,please, that the name India begins with the letter "I" and America with "Am." Is this not significant?" 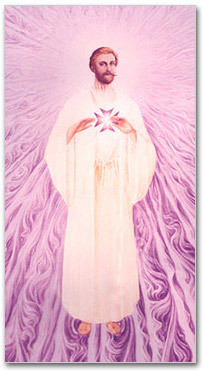 The Ascended Master Saint Germain has been called the Master Alchemist. He teaches us how to tend the flame on the altar of our hearts and transmute the metal of our souls into the gold of the Spirit. 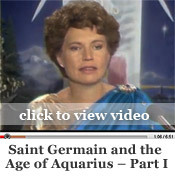 The greatest gift that Saint Germain offers mankind for the Aquarian age is knowledge of the violet fire. You can learn to transmute anything negative in your spiritual or physical being, from self-hatred to physical viruses. The beautiful prayer "I AM the Light of the Heart" by Saint Germain celebrates the divine spark within our hearts and can help us to become more heart-centered. As you recite it, visualize radiant light descending from God into your heart chakra, where it will be released…See thousands of sun beams going forth from your heart to penetrate and dissolve any darkness within yourself, loved ones and then within the people of the world. Project your love (which is really God’s love) out into the world. See that love going forth as intense fiery-pink laser beams that break down barriers to the success of your relationships, your family, your spiritual growth, your career, your neighborhood or your nation. And break down all barriers.